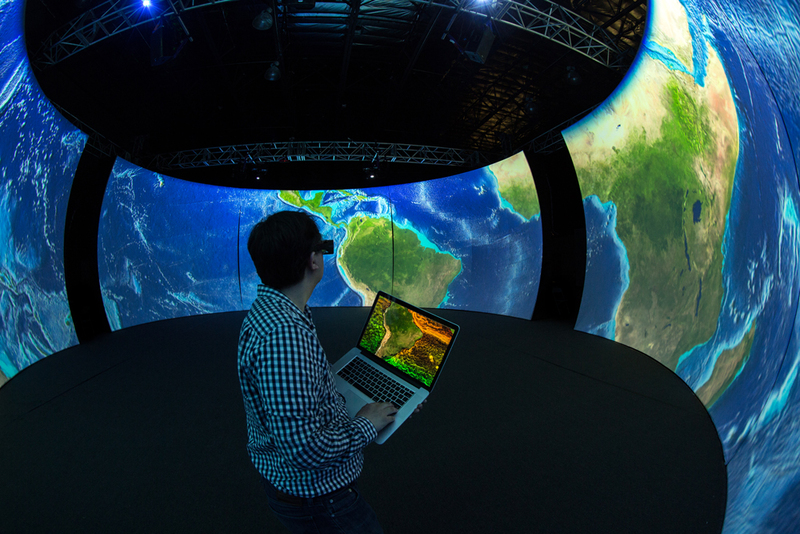 Over one hundred people at any given time can experience fully immersive, active stereo (3D) content in the 21st Century Cyclorama, designed and engineered by Milwaukee-based immersive projection design company, The Elumenati. For over ten years, The Elumenati team has built a reputation as pioneers in immersive technology. 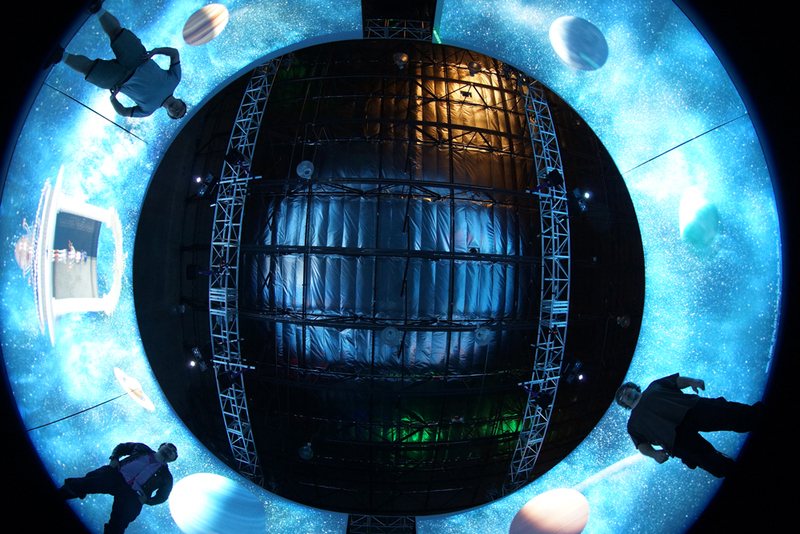 A broad range of artistic, commercial, and educational clients, such as NASA, NOAA, Cirque du Soleil, and DreamWorks use Elumenati domes, projection systems, interactive software, and custom installations. In 2013, a private client asked the team to create an experience comprising a 42-foot by 15-foot tall, 360-degree space to enthrall over one hundred visitors at any given time with dynamic, high-resolution, stereo content. The 21st Century Cyclorama reflects The Elumenati's design philosophy of building cutting-edge environments that are as efficient as they are elegant. "It’s a giant 3D theater that wraps around you in all directions," says Hilary McVicker, VP of Sales and Marketing at The Elumenati. Four edge-blended projection channels fill the space with active stereo content, while allowing guests to stand as close as 4 feet from the screens without casting shadows. Digital Projection's (DP) TITAN WUXGA Quad 3D, 3-chip DLP projectors were chosen to project high-resolution stereo imagery with beautiful color in the large space. "We chose to work with DP because their products have been extremely reliable over the years, and they’re always open to engineering collaborations, allowing us to build projection systems with optimal image quality," says McVicker. 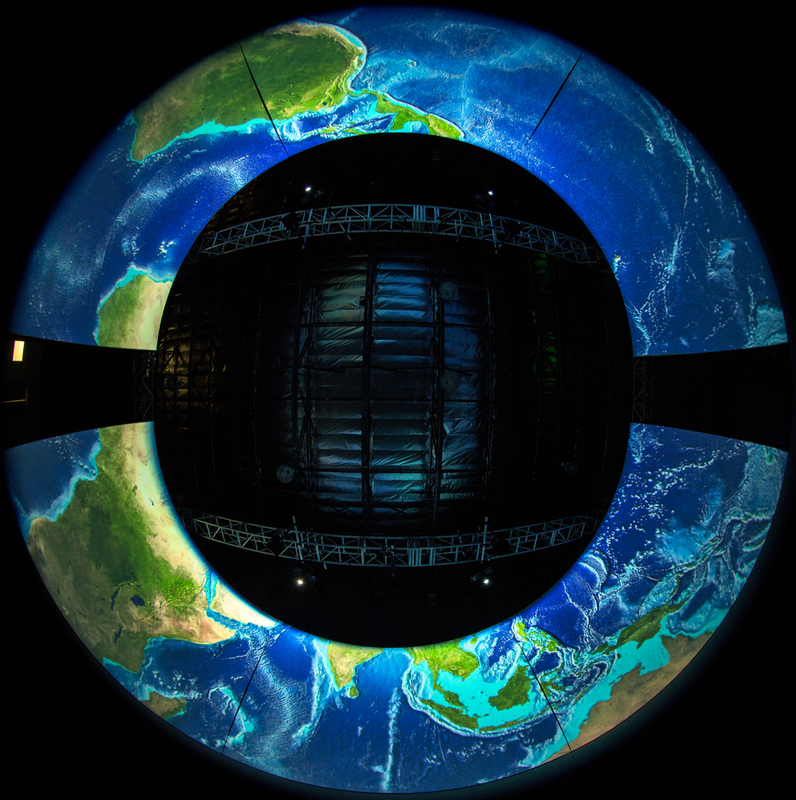 Four Elumenati OmniFocus 30620 projection systems were used, combining the strengths of DP's TITAN projector with a 600 series fisheye lens developed and engineered by The Elumenati. Each projector offered 20,000 lumens brightness, with a total resolution of nearly 8K across the 360-degree space. "It doesn't matter how cool the technology is, what the audience remembers is the overall experience, and the story our clients are using the technology to tell," McVicker says. "The projectors are edge-blended in a way that concentrates brightness and resolution in the areas where the audience naturally tends to focus. We worked with the client to place the most important parts of the content in that space, so the most dynamic imagery was happening in the place where the image looked the sharpest and had the best color saturation." 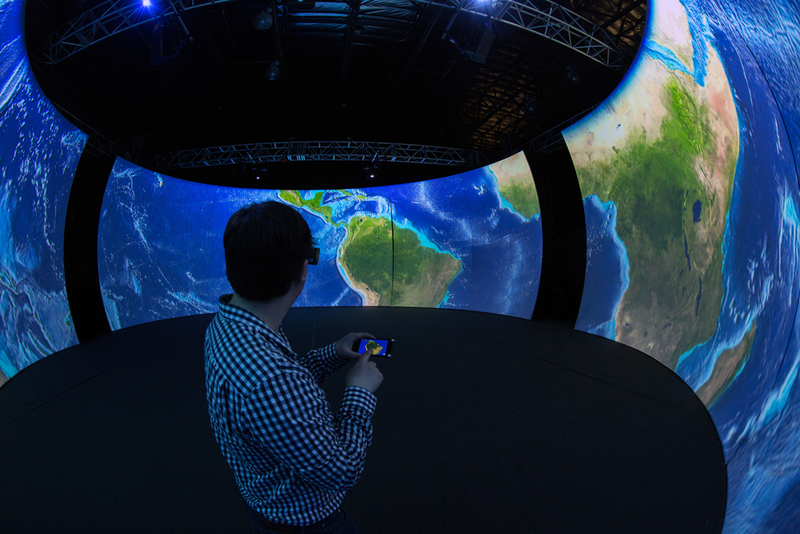 To create a fully immersive experience, it is critical that the technology is not obtrusive. The four projectors with fisheye lenses are mounted on a truss just above the curved screen walls. "With the fisheye projectors, you can stand very close to the screen without casting a shadow," says McVicker. "People can move around naturally without having to stay in one spot or avoid certain areas." To support edge-blended stereo with multiple projectors, Elumenati created a custom version of Omnity, a plugin for the Unity3D game engine based on their OmniMap geometry correction software. "This lets us run all of the content through a single computer instead of four," explains McVicker. "It's a single content channel that our software splits into the four projector outputs and projects onto the curved screen with edge-blending. It greatly simplifies the content creation process for our clients." 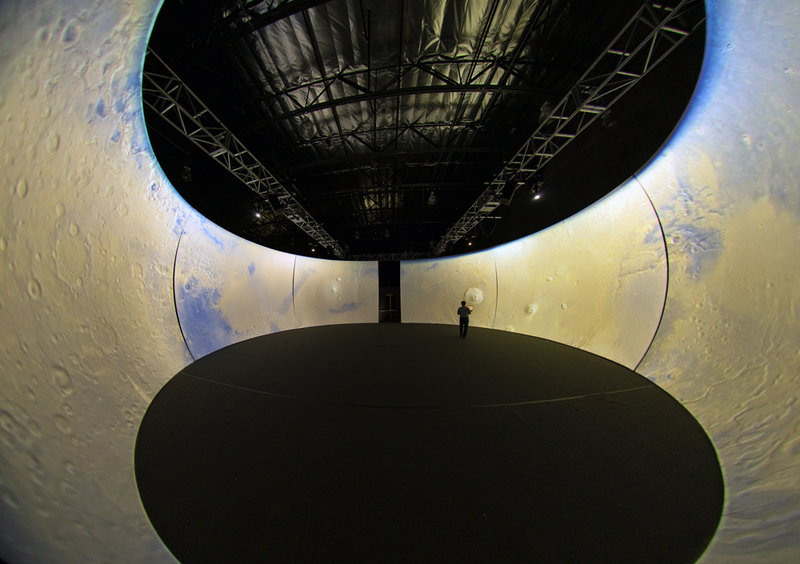 The Cyclorama space is an Elumenati OpenDome Panorama, 42-feet in diameter and 15-feet tall. The semi-permanent structure features a metal frame and a fabric screen with Elumenati’s patented dual-pressure technology. "There's a screen at the back of the screen that is pulling air back, and sucking the screen tight against the shape of the panorama," McVicker says. "We design screens in all sorts of shapes and sizes. The type of dome depends on the experience you want to create as much as the space where you are putting it." Guests in the Cyclorama wear Volfoni's Edge 3D glasses, bringing the stereo content to life. “The audience emerges from the 21st Century Cyclorama talking about the amazing experience of being transported to another world, if only for a moment," concludes McVicker.